The recent investigation suggested that the TDP-43 protein was closely related to the motor neuron degeneration in amyotrophic lateral sclerosis (ALS), but the pathogenesis contributed to motor neuron degeneration largely remained unknown. Therefore, we detected the alteration of TDP-43 expression and distribution in the adult spinal cord of the SOD1 G93A transgenic mouse model for searching the possible pathogenesis of ALS. We examined the TDP-43 expression and distribution in the different anatomic regions, segments and neural cells in the adult spinal cord at the different stages of the SOD1 wild-type and G93A transgenic model by the fluorescent immunohistochemical technology. We revealed that the amount of TDP-43 positive cell was cervical>lumbar>thoracic segment, that in the ventral horn was more than that in the dorsal horn, a few of TDP-43 protein sparsely expressed and distributed in the other regions, the TDP-43 protein weren't detected in the white matter and the central canal. The TDP-43 protein was mostly expressed and distributed in the nuclear of neuron cells and the cytoplasm of oligodendrocyte cells of the gray matter surrounding the central canal of spinal cord by the granular shape in the SOD1 wild-type and G93A transgenic mice. The amount of TDP-43 positive cell significantly increased at the onset and progression stages of ALS following with the increase of neuron death in spinal cord, particularly in the ventral horn of cervical segment at the progression stage. Our results suggested that the overexpression of TDP-43 protein in the neuron and oligodendrocyte cell causes the progressive motor neuron degeneration in the ALS-like mouse model. Keywords: Amyotrophic lateral sclerosis. Animal models. Mechanism of neurodegenerative diseases. Motor neuron diseases. Motor neuron. Neurodegeneration. Neurodegenerative disease. SOD1. Transgenic mice. TAR DNA-binding protein 43 (TDP-43, transactive response DNA binding protein 43 kDa) is a protein which is encoded by the gene of TAR DNA-binding protein (TARDBP) in humans . TDP-43 is a transcribed inhibitor binding to the chromosomally integrated TAR DNA. TDP-43 has been revealed to combine both DNA and RNA, and have a lot of functions in the transcribed inhibition, the pre-mRNA splice and the transcribed regulation. The recent study has found that thousands of transcribed binding sites of RNAs are bound by TDP-43 in neurons . The protein of TDP-43 was also shown to modulate the splicing of the gene of CFTR and apoA-II. Particularly, it is a spliced factor combining to the intron 8/exon 9 junction of the CFTR gene and to the intron 2/exon 3 region of the apoA-II gene . The TDP-43 in the motor neurons of the human spinal cord has also been found to be a mRNA-binding protein of low molecular weight microfilament . TDP-43 also is a responsive factor of neuronal activity in the dendrites of hippocampal neurons, is suggested that its possible roles is to regulate the stability, transport and local translation of mRNA in neurons . The hyperphosphorylated, ubiquitinated and cleaved forms of TDP-43 are known as the pathological TDP-43, are the major disease proteins in the ubiquitin positive, and tau and alpha-synuclein-negative frontotemporal dementia  and in amyotrophic lateral sclerosis (ALS) . The mutations in the TARDBP gene are related to multiple types of neurodegenerative disorders, such as frontotemporal lobar degeneration (FTLD) and ALS . Particularly, the M337V and Q331K mutants in the TDP-43 gene have drawn the wide attention of investigators for their roles in ALS [9, 10]. The pathology of the cytoplasmic TDP-43 is the dominant histo-pathological features in the proteinopathy of multiple neural systems . Although a lot of studies have revealed that the TDP-43 protein plays some important roles in the pathogenesis of ALS, but the relationships between the TDP-43 protein and the developmental pathogenesis of ALS largely haven't been clear yet, including whether or not the abnormal histo-pathological expression and distribution of TDP-43 protein in the neural cells might be related to the development of ALS. Therefore, in this study, we studied the expressed and distributed alterations of TDP-43 protein in the different anatomic regions, segments and neural cells of the adult spinal cord at the different disease stages of the SOD1 wild-type and ALS-like G93A transgenic mice, aimed to investigate the possible roles of TDP-43 protein expressed and distributed alteration in the pathogenesis of ALS, and attempt to find the potential targets for the treatment of ALS. The SOD1 G93A transgenic mice of C57BL/6J  (Jackson laboratory, Bar Harbour, Maine) were bred by mating with the C57BL/6J wild-type females using the SOD1 G93A transgenic males in the neurological lab of the First Affiliated Hospital of Nanchang University. The SOD1 G93A transgenic mice were identified by the PCR of the genomic DNA extracted from tail. The following primers were used to detect whether or not the positive transgenic mice of SOD1 G93A. The IL-2 forward-primer was 5'-CTA GGC CAC AGA ATT GAA AGA TCT-3', the reverse-primer was 5'-GTA GGT GGA AAT TCT AGC ATC ATC C-3'. The hmSOD1 reward-primer was 5'-CAT CAG CCC TAA TCC ATC TGA-3', the reverse-primer was 5'-CGC GAC TAA CAA TCA AAG TGA-3'. The amplified conditions of PCR were 94°C degeneration for 3 seconds, 60°C annealing for 1 minutes and 72°C extension for 1 minutes, the total 35 cycles. The stages of ALS-like disease were divided into 3 stages according to the different time points including the pre-onset (60-70d), onset (90-100d) and progressive (120-130d) stages . Mice were sacrificed at the different time points . At the different stages of disease, the gastrocnemius muscle of abnormal limb was taken to perform the HE staining, to observe the alterations of muscle structure and morphology in the light microscope in order to identifying the paralytic severity of limb muscle and further deciding the disease courses of pre-onset, onset and progression. All experimental protocols were the same as our previous published paper . All animal studies and experiments were performed in accordance with the guide for the care and use of laboratory animals, and were reviewed and approved by the ethics committee for animal care and use of the First Affiliated Hospital of Nanchang University, China. The SOD1 wild-type and G93A transgenic mice were anesthetized and perfused using 20 ml of 0.9% saline and 40 ml of 4% PFA in 1xPBS (pH 7.5) at room temperature. The spinal cord was rapidly taken out and put into 4% paraformaldehyde buffer overnight, next days, was placed in 20% sucrose in 1xPBS incubating for 3 days (pH 7.5), then was embedded by OCT. The tissues of spinal cord were successively coronally cut into 12 μm section on a Leica cryostat and pasted on Superfrost Plus slides. In the processes of the spinal immunohistochemical staining, the sections were permeabilized using 0.2% TritonX-100 and blocked using 10% goat serum in 1xPBS after rehydrated in 1xPBS (pH 7.4), and incubated using the following antibodies (TDP-43 1:100, Santa cruz biotechnology Inc; NeuN,1:250; GFAP, 1:1000; Oli-2, 1:100 and Ox-42 1:100, Abcam (Hong Kong) Ltd.) at 4 °C overnight, subsequently washed 6 times for each 5 minutes using 0.2% Triton X-100 in 1xPBS, finally incubated using the secondary antibody (donkey anti goat, 1:250, donkey anti rabbit, 1:200) conjugated to fluorescein (Green) or/and rhodamine (Red) for 2 h at room temperature, and DAPI stained (Blue), washed 6 times for each 5 minutes using 0.2% Triton X-100 in 1xPBS, mounted with the antifade medium, and observed on a Nikon E800 fluorescent microscope with a spot digital camera (Diagnostic Instruments, Sterling Heights, MI, USA) and Photoshop software (Adobe Systems, San Jose, CA, USA). All stained photos were taken. The double or triple labeled fluorescent histochemistry using anti-TDP-43, NeuN, GFAP, Oli-2, Ox-42 antibodies and DAPI was applied to investigate the alteration of TDP-43 expression and distribution in the spinal cord of the SOD1 wild-type and G93A transgenic mice model of ALS. The analysis of fluorescent immunohistochemical positive cells was conducted through counting the amounts of positive cells under 200 magnifications, per mouse was randomly chosen 10 sections, and calculated the positive cells sum of all 10 sections, then the sum was divided by the total section numbers, 3 mice per group were used, the averaged amount was applied for the quantitative analysis. All experimental data were expressed using mean±SD. Specific comparison between the control and the individual experiment was analyzed by ANOVA. The correlation between the TDP-43 positive cells and the neuronal cells was analyzed by the Pearson Correlation of SPSS17. P<0.05 was considered as the statistically significant. In our bred SOD1 G93A transgenic mice, we observed the features of the typical ALS-like symptoms at the different disease courses of pre-onset, onset and progression, the manifestations from the firstly mild gait impairment, to the reduced motor function and to the ultimately muscle atrophy were consistent with the characters described by Gurney et al . The muscle pathologic results were the same as that in our previous published paper , which further confirmed the divide of different stages in our experiments. The death of neuron cells in the adult spinal cord of the SOD1 wild-type transgenic mice gradually increased from 60 days to 130 days, and there was a significant increase from 120 to 130 days in the cervical, thoracic and lumbar segments, particularly in the thoracic segment, it began to show a significant increase from 90 to 130 days (Fig. 1, 3, 5, 7). 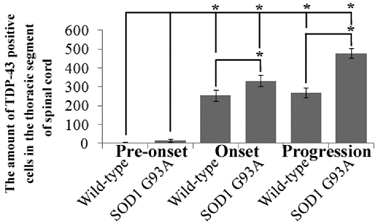 In the SOD1 G93A transgenic mice, the death of neuron cells significantly increased from 90 to 130 days (The onset and progression stages of the SOD1 G93A transgenic mice) compared with the SOD1 wild-type transgenic mice (Fig. 1, 3, 5, 7). The amount of neuron cells (NeuN positive cells) in the cervical segment of spinal cord at the different stages of the SOD1 wild-type and G93A transgenic mice. In the SOD1 wild-type mice, the neuron cells weren't significantly different between the period of the pre-onset (60-70 days) and the onset (90-100 days) stages of ALS, but the neuron cells significantly decreased at the period of the progression stage (120-130 days) (*p<0.05). 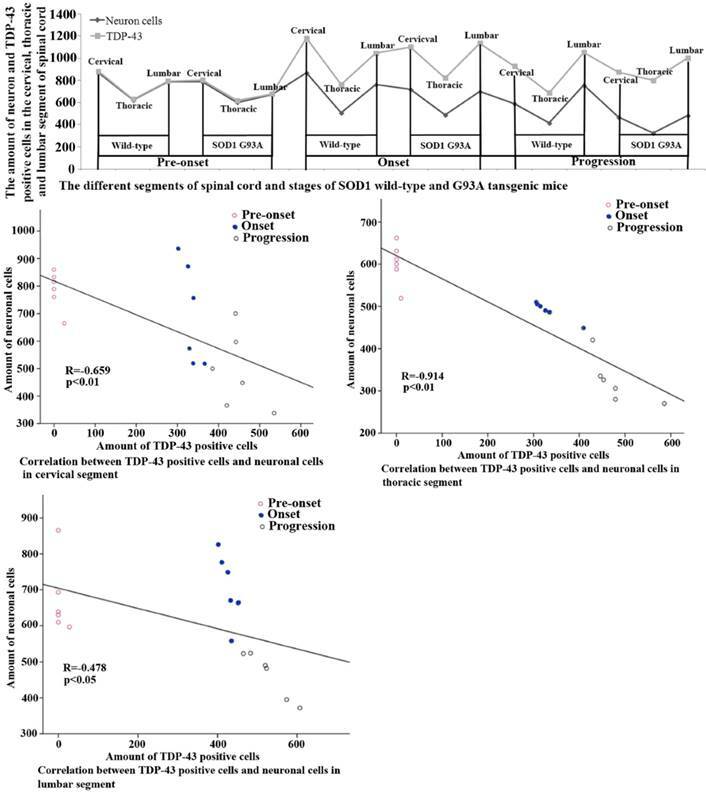 In the SOD1 G93A mice, the neuron cells gradually decreased from the pre-onset to the progression stages of ALS, but the neuron cells significantly decreased compared with the SOD1 wild-type mice at the onset and progression stages (*p<0.05). The result indicated that the neuron cells existed a gradual decrease tendency from 60 to 130 days, and the neuron cells significantly decreased after 120 days in the normal life-span of mice, but the neuron cells significantly decreased from 90 days in the SOD1 G93A mice. The decrease of neuron cells in the SOD1 G93A mice was significantly earlier than that in the wild-type mice (*p<0.05). The significant death of neuron cells began from the onset stage of ALS in the cervical segment of spinal cord. The amount of TDP-43 positive cells in the cervical segment of spinal cord at the different stages of the SOD1 wild-type and G93A transgenic mice. 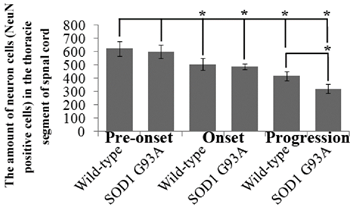 The TDP-43 amount significantly increased from 90 days of the SOD1 wild-type and G93A transgenic mice (*p<0.05), and the increase of TDP-43 amount in the SOD1 G93A mice was more significant than that in wild-type mice (*p<0.05). The result indicated that the abnormal increase of TDP-43 protein mainly occurred at the onset and progression stages during the development of ALS in the cervical segment of spinal cord. The amount of neuron cells in the thoracic segment of spinal cord at the different stages of the SOD1 wild-type and G93A transgenic mice. The neuron cells significantly decreased from the period of onset stages of ALS in the SOD1 wild-type and G93A transgenic mice (*p<0.05), and the decrease of neuron cells at the progression of SOD1 G93A mice was more significant than that at the pre-set and onset stages (*p<0.05). The result indicated that the significant death of neuron cells mainly occurred at the progression stage of ALS in the thoracic segment of spinal cord. The amount of TDP-43 positive cells in the thoracic segment of spinal cord at the different stages of the SOD1 wild-type and G93A transgenic mice. There almost weren't the TDP-43 positive cells distribution in the period of pre-onset of the SOD1 wild-type and G93A transgenic mice. The TDP-43 positive cells dramatically increased at the period of the onset and progression stages in the SOD1 wild-type and G93A transgenic mice, the increase of TDP-43 in the SOD1 G93A transgenic mice was more significant than that in the wild-type mice. The TDP-43 protein gradually increased at the period of the onset and progression stages of both the SOD1 wild-type and G93A transgenic mice, but the increase of TDP-43 protein in the G93A transgenic mice was more significant than that in the wild-type mice. The results indicated that the abnormal increase of TDP-43 took part at the onset and progression during the development of ALS in the thoracic segment of spinal cord. The amount of neuron cells in the lumbar segment of spinal cord at the different stages of the SOD1 wild-type and G93A transgenic mice. The neuron cells significantly decreased at the progression of the SOD1 G93A transgenic mice, the amount of neuron cells weren't any significant difference at the period of the pre-onset and onset stages of the SOD1 wild-type and G93A transgenic mice. The results indicated that the significant death of neuron cells mainly occurred at the progression stages of ALS in the lumbar segment of spinal cord. The amount of TDP-43 positive cells in the lumbar segment of spinal cord at the different stages of the SOD1 wild-type and G93A transgenic mice. 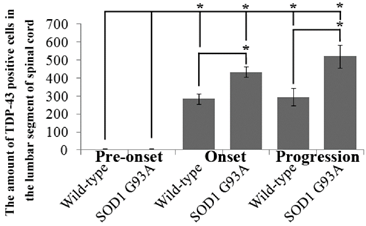 There almost weren't the TDP-43 positive cells distribution in the pre-onset of the SOD1 wild-type and G93A transgenic mice. The TDP-43 positive cells dramatically increased at the period of the onset and progression stages in the SOD1 wild-type and G93A transgenic mice, the increase of TDP-43 in the SOD1 G93A transgenic mice was more significant than that in the wild-type mice. The results indicated that the abnormal increase of TDP-43 participated in the onset and progression stages during the development of ALS in the lumbar segment of spinal cord. The TDP-43 positive cell mainly expressed and distributed in the gray matter surrounding the central canal of the adult spinal cord in the SOD1 wild-type and G93A transgenic mice, that in the ventral horn was more than that in the dorsal horn, the more close to the central canal was the more intensive expression and distribution (Fig. 8), a few of TDP-43 positive cell sparsely expressed and distributed in the other regions of the spinal cord, there weren't the expression and distribution of TDP-43 protein in the white matter and the central canal of spinal cord (Fig. 8). The expression and distribution of TDP-43 protein in the different anatomic regions and segments of spinal cord was significantly different (Fig. 2, 4, 6, 8). The rank order of total amount of TDP-43 positive cell in the cervical, thoracic and lumbar segments of the entire spinal cord was the cervical more than the lumbar more than the thoracic segment (i.e. cervical>lumbar>thoracic segment) (Fig. 7). The amount of TDP-43 positive cell in the other anatomic regions and segments of the entire spinal cord wasn't significantly different. The TDP-43 protein mainly expressed and distributed by the granular shape in the nuclear of neuron cells and the cytoplasm of oligodendrocyte cells, and almost weren't detected in the astrocyte and microglia cell in the different anatomic regions and segments of the adult spinal cord at the different stages of the SOD1 wild-type and G93A transgenic mice, (Fig. 9A, 9B). The majority of TDP-43 protein was expressed and distributed in the nuclear of neuron cells, secondary in the cytoplasm of oligodendrocyte cell in the SOD1 wild-type and G93A transgenic mice. In the SOD1 G93A transgenic mice, the neuron and oligodendrocyte cells of TDP-43 protein expression significantly increased in the gray matter surrounding the central canal of the cervical, thoracic and lumbar segments of spinal cord at the onset and progression stages compared with the SOD1 wild-type transgenic mice, that in the ventral horn was more significant than that in the dorsal horn and in the other regions. The increase rank order of TDP-43 positive cell amount was cervical>lumbar>thoracic segment (Fig. 7). The significant alteration of TDP-43 positive cells wasn't detected in the other anatomic regions, segments and neural cells of spinal cord of the SOD1 G93A transgenic mice, including the white matter and the central canal regions, the astrocyte cell and the microglia cell. The mislocalization (Abnormal translocation and redistribution) from one anatomic region to another region, from one segment to another segment, and/or from unclear to cytoplasm didn't occur in the different anatomic regions, segments and neural cells of spinal cord at the different disease stages of the SOD1 G93A ALS-like transgenic mice. The relationship between the neuron cells decrease and the TDP-43 protein increase in the cervical, thoracic and lumbar segments of spinal cord at the different stages of the SOD1 wild-type and G93A transgenic mice. The increase of neuron death was consistent with the increase of TDP-43 protein in the cervical, thoracic and lumbar segment of spinal cord and at the onset and progression stages of the SOD1 wild-type and G93A transgenic mice, and the relationship between the neuron cells decrease and the TDP-43 protein increase in the SOD1 G93A transgenic mice was particularly significant compared with that of the wild-type transgenic mice. The results indicated that the increase of TDP-43 protein contributed to the progressive neuron death in the development of ALS. 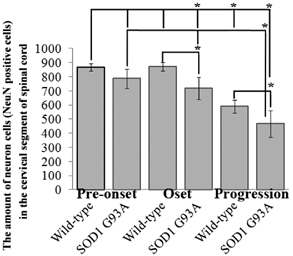 The TDP-43 expression and distribution in the different regions of spinal cord at the different stages of the SOD1 wild-type and G93A transgenic mice. The TDP-43 positive cells mainly were distributed in the gray matter surrounding the central canal of spinal cord, that in the ventral horn was more than that in the dorsal horn of spinal cord. The expression and distribution of TDP-43 positive cells was closer to the central canal and the more intensive. The TDP-43 positive cells weren't detected in the central canal and the white matter of spinal cord. 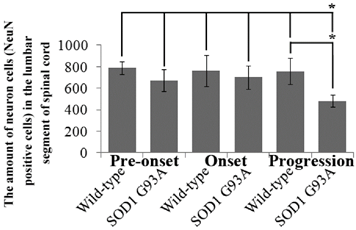 The Figure 8 was the representative images of the TDP-43 expression and distribution in the different regions of spinal cord at the different stages of the SOD1 wild-type and G93A transgenic mice. Abbreviation: VH=Ventral Horn; CC=Central Canal; DH=Dorsal Horn. White arrow indicates the positive cell. The systematic analysis on the alteration of TDP-43 protein expression and distribution in the different anatomic regions, segments and neural cells of spinal cord during the different stages in the SOD1 wild-type and G93A transgenic mice, which demonstrated that the increase of TDP-43 protein expression and distribution was negatively correlated with the decrease of neuron cell amount in the cervical, thoracic and lumbar segments of the adult spinal cord at the pre-onset, onset and progression stages in the SOD1 wild-type and G93A transgenic mice. The death of neuron cells was closely related to the increase of TDP-43 protein expression and distribution, which implied the more increase of TDP-43 protein and the more increase of neuron cell death (Fig. 7). Notably, the neuron cell death significantly increased following with the increase of TDP-43 protein expression and distribution during the onset and progression stages of the ALS-like G93A SOD1 transgenic mice compared to the age-matched wild-type transgenic mice (Fig. 7), suggesting that there was an overexpression of TDP-43 protein contributed to the neuron cell death in the adult spinal cord of the ALS-like mice. To our knowledge, this might be a more systematical examine about the TDP-43 protein expressed and distributed alteration in the different anatomic regions, segments and neural cells of the adult spinal cord at the different stages of the SOD1 wild-type and G93A transgenic mouse model. Our study demonstrated the following five major findings: 1). The majority of the TDP-43 protein expression and distribution were found in the gray matter surrounding the central canal of the adult spinal cord in the SOD1 wild-type and G93A transgenic mice, the more close to the central canal and the more intensive expression and distribution, the TDP-43 protein in the ventral horn was more than that in the dorsal horn, only a few of TDP-43 protein sparsely expressed and distributed in the other regions, the TDP-43 protein expression and distribution wasn't found in the white matter and the central canal; 2). The TDP-43 protein mainly expressed and distributed in the nuclear of neuron cells and the cytoplasm of oligodendrocyte cells by the granular shape in the adult spinal cord at the different stages of the SOD1 wild-type and G93A transgenic mouse model, the TDP-43 protein expression and distribution almost weren't detected in the astrocyte and microglia cell. 3). A major increase of TDP-43 protein expression and distribution occurred in the gray matter surrounding the central canal regions of the spinal cord during the onset and progression stages of the ALS-like SOD1 G93A transgenic mice, particularly in the ventral horn at the onset and progressive stages, only a few of increased TDP-43 protein sparsely expressed and distributed in the other regions, the increase of TDP-43 protein wasn't detected in the white matter and the central canal; 3). The increased TDP-43 protein expression and distribution in the ALS-like SOD1 G93A transgenic mice only consisted of the neuron cells and the oligodendrocyte cells, the majority was in the neuron cells, which suggested that the TDP-43 protein expression and distribution wasn't the redistribution between the different neural cells of spinal cord, and the damage of both neuron and oligodendrocyte cells involved in the motor neuron degeneration of ALS, not only simplex neuron cell involved in ALS; 4). The TDP-43 expression and distribution in the different neural cells at the different stages of the SOD1 wild-type and G93A transgenic mice. Almost all TDP-43 positive cells were distributed by the granular shape in the unclear of the neuron cells and the cytoplasm of oligodendrocyte cells in the SOD1 wild-type and G93A transgenic mice, the majority of TDP-43 positive cells were distributed in the neuron cells, the TDP-43 positive cells almost weren't detected in the astrocyte and microglia cell. The results indicated that the TDP-43 protein mainly expressed in the neuron cells and oligodendrocytes cells, particularly in the neuron cells. 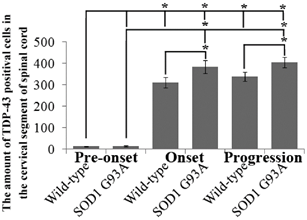 The Figure A and B were the representative images of the TDP-43 expression and distribution in the different neural cells at the different stages of the SOD1 wild-type and G93A transgenic mice. The increased TDP-43 protein expression and distribution wasn't significantly different in the different anatomic regions and segments of spinal cord in the SOD1-G83A transgenic mice, suggesting that there didn't exist the redistribution or translocation among the different anatomic regions and segments. 5) All increased TDP-43 protein expression and distribution in the different anatomic regions and segments of spinal cord were consistent with the neuron death during the onset and progression stages of the ALS-like SOD1 G93A transgenic mice, suggesting that the abnormal increased (Overexpression) TDP-43 protein expression and distribution were a potential toxic factor of motor neuron degeneration in ALS. This study provided some novel evidences that the abnormal increase of TDP-43 protein expression and distribution in the neuron cells and the oligodendrocyte cells of spinal cord were closely related to the pathological processes of motor neuron degeneration in ALS. Two studies revealed that the TDP-43 protein produced a hyperphosphorylation, ubiquitination and aggregation in the affected cells in some sporadic ALS patients, which implied that the normal TDP-43 protein were aberrantly modified and accumulated, which generated the toxic to some vulnerable neurons [7, 15]. The overexpression of the gene of normal human TDP-43 could induce the neuron neurodegeneration in several transgenic animals [16-18]. Several clinical investigations exhibited that the variation of the 3'-untranslated region in the TDP-43 gene was relative to the increase of the TDP-43 gene expression in the ALS patients [19, 20]. In additional, more mutations of TDP-43 gene were one after another found, among them, the predominantly affected conserved C-terminal glycine-rich domain of TDP-43 was predicted to be the abnormal RNA or protein interactions, which might induce to produce the abnormal TDP-43 protein [20-22]. The TDP-43 protein was reported to only express in the nuclear of neural cells, and to redistribute from the nuclear to the cytoplasm in the spinal motor neurons and glial cells in the pathologic condition of ALS . The previous studies collectively suggested that the TDP-43 protein might play some important effects in the lesion of vulnerable neurons when the TDP-43 generated the hyperphosphorylation, ubiquitination, aggregation and/or mislocalization, resulted in the damage of development and the production of toxicity because of the pathogenic mutation and/or aberrant increase of gene expression in affected cells [7, 15-20, 23], but there hasn't been an affirmative conclusion approved by many researchers up to now. The TDP-43 protein was found to be a major component of the characteristic ubiquitinated inclusions in the neuronal and glial cells of some ALS patients , but the pathogenic mutations, the abnormal expressive increase of gene, the hyperphosphorylation, ubiquitination, mislocalization, and/or aggregation of TDP-43 protein in the affected neural cells haven't been further proofed to be the pathogenicity of ALS by the enough evidences yet. Some investigators suggested that the TDP-43 protein, as a disease causative protein, didn't redistribute from the nucleus of its normal location to the cytoplasm [24, 25], and the mislocalization to the ubiquitinated inclusions or cytoplasm of TDP-43 protein was not detected in the cells of ventral horn, the abnormal phosphorylation or truncation of TDP-43 weren't observed in the sections of spinal cord and brain in the SOD1 G93A transgenic mouse model yet . In the previous evidences about the TDP-43 protein in the development of ALS, there were a lot of debates. Among them, the expression and distribution alterations of TDP-43 protein in the different anatomic regions, segments and neural cells of spinal cord during the different disease stages of ALS haven't been completely elucidated up to now. The examination of TDP-43 protein expression and distribution is an important preliminary study for further investigating the pathogenic mutation, the aberrant increase of gene expression, the hyperphosphorylation, ubiquitination, mislocalization, and/or aggregation of TDP-43 protein. 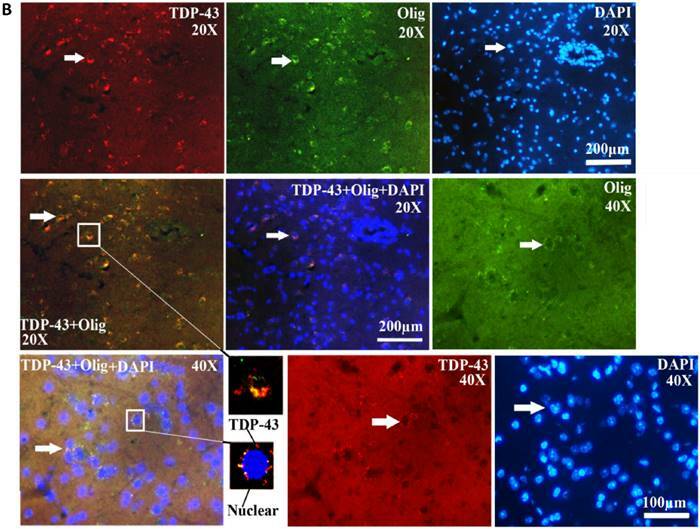 A series of investigations about the pathogenic roles of TDP-43 protein reported various staining patterns of TDP-43 protein expression and distribution from the diffuse distribution to the strict co-localization in the spinal cord and brain of ALS. However, a lot of reliable details of TDP-43 protein expressed and distributed abnormalities occurred in the motor neuron degeneration of ALS remain unclear. Here, we systematically observed and analyzed the features of TDP-43 protein expressed and distributed alteration in the different anatomic regions, segments and neural cells of the adult spinal cord at the different stages of the SOD1 wild-type and G93A transgenic mouse model, and compared the different of TDP-43 protein alteration between the SOD1 wild-type and G93A transgenic mice. Our results revealed several novel insights. Firstly, the TDP-43 protein mainly expressed and distributed in the gray matter surrounding the central canal of the adult spinal cord in the SOD1 wild-type and G93A transgenic mice, the more close to the central canal and the more intensive expression and distribution, the TDP-43 protein in the ventral horn was more than that in the dorsal horn, only a few of TDP-43 protein sparsely expressed and distributed in the other regions, there weren't the TDP-43 protein expression and distribution in the white matter and the central canal. The previous studies only observed the TDP-43 protein distribution in the neuron cell in the ventral horn of spinal cord in the SOD1 wild and G93A transgenic mice and normal rat [26, 27], while didn't observe and compare the TDP-43 protein expressed and distributed alterations in the different anatomic regions, segment and neural cells of entire spinal cord. Secondly, all TDP-43 protein expressed and distributed in the nuclear of neuron cells and the cytoplasm of oligodendrocyte cells by the granular shape in the adult spinal cord of both the SOD1 wild-type and G93A ALS-like transgenic mice, there weren't the TDP-43 protein expression and distribution in any other neural cells. Our result didn't detect the redistribution of TDP-43 protein from the nuclear to the cytoplasm in the spinal motor neurons and glial cells. However, in the previous report, it suggested that the TDP-43 protein only expressed in the nuclear of neural cells, the redistribution of TDP-43 protein from the nuclear to the cytoplasm in the spinal motor neurons and glial cells were the characteristic of ALS pathology . Thirdly, the TDP-43 protein only expressed and distributed in the neuron cells and oligodendrocyte cells, the other neural cells weren't detected the TDP-43 protein expression and distribution. In the past investigation, only reported that the TDP-43 protein expressed and distributed in the spinal motor neurons and glial cells, didn't systematically observed, analyzed and compared the TDP-43 protein expression in what type of glial cell . Our result clarified that the TDP-43 protein only expressed and distributed in oligodendrocyte cell, but not in the astrocyte and microglial cells. Fourthly, the TDP-43 protein expression weren't the redistribution or translocation (Mislocalization) in the different anatomic regions, the different segments and the different neural cells of spinal cord during the period of the motor neuron degeneration in whole ALS-like disease courses. Fifthly, the increase of TDP-43 protein expression and distribution was negatively correlated with the amount of neuron cells in the spinal cord of SOD1 G93A transgenic mice, the increase of TDP-43 protein expression and distribution was followed with the increase of neuron death, which implied that the overexpression of TDP-43 protein in the neuron and oligodendrocyte cells was a potential toxic factor of motor neuron degeneration in ALS. The similar results weren't reported in the past study. In our study, although the SOD1 G93A transgenic mouse model might not accurately reflect the pathogenesis found in the vast majority of human cases, it is still the most commonly used mouse models in the pathogenesis of ALS at present . Therefore, we applied this mouse model to study the possible role of TDP-43 in the pathogenesis of ALS. We obtained some novel results about the TDP-43 protein expression and distribution alteration in the role of ALS development, but in view of the deficiency of the SOD1 G93A transgenic mouse model, our result need been further validated in the vast human ALS cases. Even so, our data provided some important evidences and clues for further investigating the role of TDP-43 protein in the development of ALS. In general, our study about the TDP-43 protein expressed and distributed alteration in the spinal cord of the SOD1 G93A transgenic mouse model of ALS showed that the TDP-43 protein wasn't mislocalization, which was consist with the previous studied result . In addition, this study also revealed the expression and distribution of TDP-43 protein in the neuron and oligodendrocyte cells significantly increased in ALS-like mice followed with the significant neuron death, which is a novel finding. 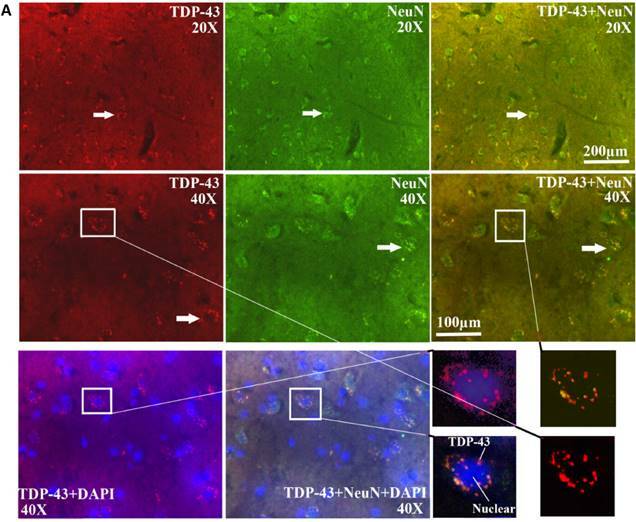 Therefore, we suggested that the overexpression of TDP-43 protein in the neuron and oligodendrocyte cells could induce the neuron degenerative death in ALS through the pathogenic effect of TDP-43 protein which results from the formation of toxic aggregates, but no from the loss of its function. TDP-43: TAR DNA-binding protein 43; GFAP: glial fibrillary acidic protein; NeuN: hexaribonucleotide Binding Protein-3; Oli-2: anti-oligodendrocyte antibody-2; Ox-42: Integrin αM; DAPI: 4', 6-diamidino-2-phenylindole. We gratefully thank that this work was supported by grants from the National Natural Science Foundation of China (30560042, 81160161, 81360198), the education department of Jiangxi province (GJJ10303) and Jiangxi provincial department of science and technology (-47). All authors contributed significantly to this research and preparation of the manuscript. X.S. and L.Y. conceived and designed the experiments and wrote the manuscript. L.Y. T.Y. Z.L. L.J. L.T. and Z.J. performed the experiments and analyzed the data. L.Y. T.Y. Z.L. and L.J. are the first author and contributed equally to the work. All authors have been involved in the drafting, critical revision and final approval of the manuscript for publication. All authors agree to be accountable for all aspects of the work in ensuring that questions related to the accuracy or integrity of any part of the work are appropriately investigated and resolved.